" McKibben is] a marvelous writer who has thought deeply about the environment, loves this part of the country, and knows how to be a first-class traveling companion." 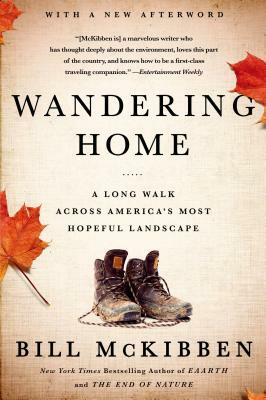 --"Entertainment Weekly"
In one of his most personal books, Bill McKibben invites readers to join him on a hike from his current home in Vermont to his former home deep in the Adirondacks. Here he reveals that the motivation for his impassioned environmental activism is not high-minded or abstract, but as tangible as the lakes and forests he explored in his twenties that inspired him to quit the "New Yorker" and dedicate his life to saving them, the same woods where he lives with his family today. Bill McKibben opens his journey taking in the stunning rain-washed, rainbow-filled vista from atop Mt. Abraham, Vermont; and from here he oversees his path west toward the broad Champlain Valley, the expanse of Lake Champlain, and behind it the towering wall of the Adirondacks. Over the course of his walk he meets with old friends and kindred spirits, including activists, writers, organic farmers, a vintner, a beekeeper, and environmental studies students, all communing with nature and committed to the environmental movement. Now with a new afterword that brings the story up to date, "Wandering Home" reveals McKibben's deep hope for the future of sustainable living, climate change--and the fate of these trees, these groves, these bears, these lakes. For McKibben, there is no better place to work out the how to strike a balance between the wild and the cultivated, the individual and the global community, and perhaps discover the answers to the challenges that the shifting planet poses today.